With a passion for art from an early age, I turned my driving interest in art to a career in photography and later art education. 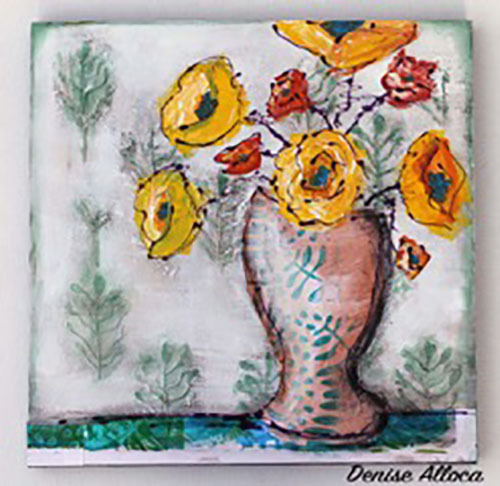 Through my diverse exposure to various art forms, I found my way to mixed media art, where I currently can be found showcasing my work on my blog at denisealloca.blogspot.com. Everyday is an art adventure, and I can’t wait to get my hands full of paint. My creations can be found on my Etsy store, www.etsy.com/shop/MyArtAdventures and you can also follow me on Instagram, @denisealloca. Currently I am a part of the Jessica Sporn Designs Creative Team, continuing my passion for creative play. I am looking forward to what the creative future has in store as I continue on this journey!